Description: Umm…. basic dog treats…? Dissolve the yeast in the lukewarm chicken or meat broth. The richer this broth is, the better your dog will like the biscuits. Let yeast broth mixture set 10 min. Then stir in flour mixture. Roll resulting dough out 1/4″ thick. 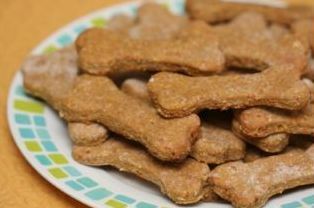 Cut dog biscuit shapes from dough. Brush biscuits with egg wash.
Bake on greased cookie sheets at 300 F for 45 min. Then turn off oven and leave in overnight to finish hardening.